Is yoga on your New Year’s resolution list? Would you like to make yoga your New Year’s resolution? This is a tough topic to write about, as New Year’s resolutions for yoga seekers or anybody don’t seem to stick for very long. Why is that? If these New Year’s yoga resolutions are so important, why were they not started sooner? Short answer is, whenever these New Year’s resolutions are implemented, whether it’s actually New Year’s or not, it’s going to be tough, which is why they didn’t happen sooner! It’s tough because the implementation of healthy activities or the eradication of unhealthy activities means changing previous patterns. Patterns in this case are like addictions; mentally or physically, we become accustomed to them. Whenever you stop feeding a pattern or addiction, there is withdrawal symptoms, which many don’t find their way through. This is tough stuff, yet this is quite possibly only half the equation. The other half may be the lifestyle, i.e. home, family, friends, work etc… that may have facilitated these patterns. Most likely the reason most people don’t follow through with their resolutions is that they are not looking at this big picture. For example, if you are overeating or smoking to deal with family or workplace stress, changing your diet or quitting smoking is only half the equation, because that stress is still there. 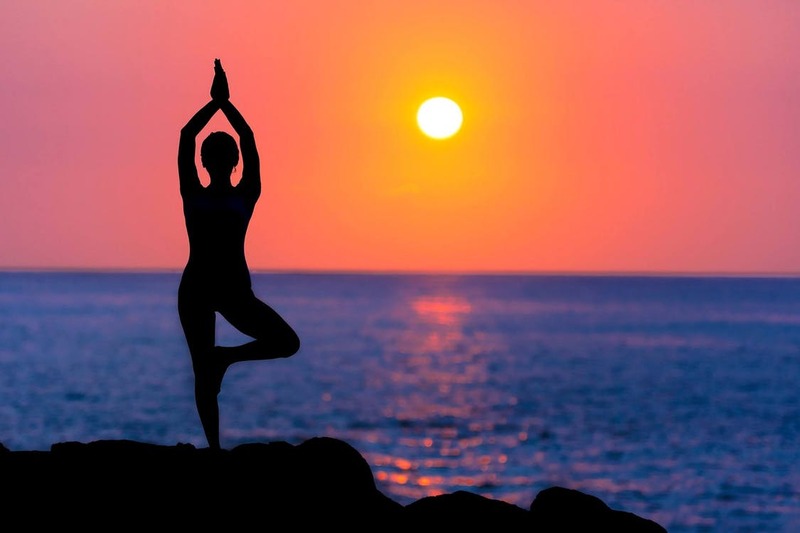 Yoga-inspired New Year’s resolutions are great for this, as yoga in general is a great stress buster. The reason yoga works so well is yoga helps bring awareness, so that we can steer ourselves away from stress-inducing reactions or situations. Could you imagine your friends are not really your friends? Could you imagine your job or its environment is not optimal for you? Could you imagine needing to deal with a toxic family situation etc…? Shifting your environment may play a large role in fulfilling your resolutions. You know some “friends” are only our friends because we help them support their own negative behaviors. As soon as we no longer want to gossip or drink or partake with them in unhealthy behaviors, they turn on us. This might mean for a time we will be alone and this might seem scary as well. Yet since “like attracts like“ and we are no longer wanting to indulge in unhealthy behaviors, it’s only natural that we move on, and this moving on is a process of being alone until “like attracts like“ and new relationships start to bloom. So obviously there are many reasons why we don’t hold on to our resolutions, and one resolution might lead to unintended and difficult consequences. Basically, we opened up a can of worms! Yet this is the process of healing and wellness, so be ready. One way to be ready is find a friend that will never leave you. I’m talking about a support practice. This practice could look many different ways but what it really is, is a yoga practice. A time dedicated to oneself! Time to breathe, stretch and become quiet. If you have not tried yoga, try one different type of yoga class a week until you find the type you resonate with, because you could easily dislike one class and love another. This yoga practice will support you through the multiplicity of withdrawal symptoms and changes and facilitate a healthy lifestyle, which ultimately will create a healthy community around you. So your yoga pose for the new year and your yoga sequence for the new year will be the poses and sequences you resonate with. Remember you are unique, and your poses and sequences need to conform to you and not vice versa. These yoga poses and yoga sequences will also shift and change, as you shift and change. Studio and online classes are a great way to begin, as being guided through this can be very supportive. You may be gung ho, but start slow. My suggestion, 30 to 45 minute classes, three times per week. From there, let’s see what happens!